Begin the drive to better service with Ammstar’s Mercedes-Benz Service A.
Mercedes-Benz service terminology can be confusing. So when your vehicle’s Service ASSYST system starts telling you that your vehicle needs a service, your first instinct may be to scratch your head and wonder what that involves. Service A (also known as ASSYST 1) is the basic service package for all Mercedes-Benz vehicles. It is required generally every 25,000 kilometres or 12 months, whichever comes first. Ammstar operates independently from the dealership but importantly, follows the manufacturer’s recommendations, ensuring your vehicle is in safe and qualified hands. What’s included in Mercedes-Benz Service A? The following are essential routine maintenance tasks your Mercedes-Benz requires to continue performing at its best. Discover what’s included in Service A. Any mechanic can replace your engine oil and filter. However, your Mercedes is designed to operate with specific oils and fluids – and only a specialist Mercedes-Benz mechanic knows which ones are best suited to your model. As part of Service A, Ammstar performs a comprehensive safety check of your vehicle. Among other things, we inspect your handbrake, seatbelts, and all interior and exterior lights for function. If we uncover faults, we’ll advise and quote repair or replacement. 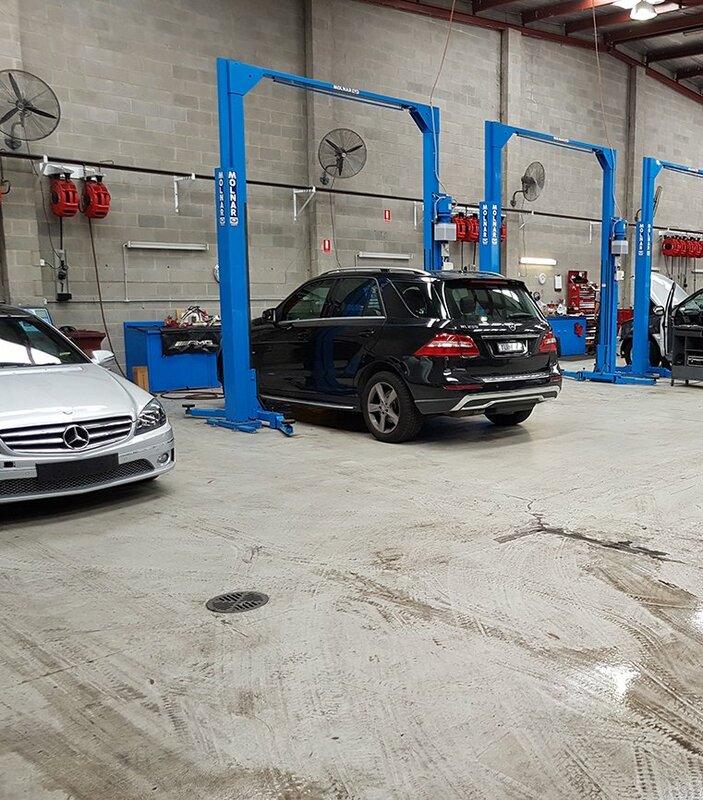 Our skilled Mercedes-Benz technicians also inspect things like your hydraulic brake fluid, engine coolant, power steering and washer fluid, topping them up as needed. We’ll also check your battery, and lubricate things like door hinges, latches, and locks, if required. Healthy tyres don’t just ensure a smooth ride – they’re essential for your vehicle’s fuel efficiency, and most importantly, safety. Our Mercedes-Benz specialists carefully inspect your tyres for abnormal wear, damage, and correct pressure, including your spare if your vehicle has one! Your brakes are one of the most important systems in your vehicle. During Service A, our mechanics perform a thorough inspection of your brake pads and discs to detect potential damage or wear. We even perform specific measurements to ensure they are still within their safe working limit, ensuring an enjoyable driving experience. During service A, we’ll perform a full inspection of your car’s underbody. Our skilled technicians inspect your exhaust system, steering and suspension components, even your fuel tank and lines are checked to ensure safety on the road. This might sound simple, but you’d be surprised how many general mechanics struggle with resetting your vehicle’s on board maintenance computer! If your mechanic can’t do this, how can you be sure they’ll given your Mercedes-Benz the care and specialised attention it deserves? We don’t just look after your car’s performance or safety when performing Service A – we also look after your comfort. Service A includes an air conditioning check that tests your heating and cooling system for function and efficiency. As Mercedes-Benz specialists, our experts know what to listen out for. Our technicians have an intimate and unique knowledge of the Mercedes-Benz brand, and can accurately recognise problems and detect variations in your vehicle during a standard road test. What makes Mercedes Service A different? As the owner of a Mercedes-Benz, you know that your vehicle is a unique blend of technology, safety, and performance. And that’s why when it comes to maintenance, you should choose a specialised service centre! Unlike a routine inspection at the corner mechanic, our independent Mercedes-Benz technicians live and breathe the Mercedes brand. We see and work with Mercedes-Benz vehicles day-in and day-out. Each of these keeps your Mercedes-Benz running the way it was designed. Only a qualified team of Mercedes specialists can offer these.